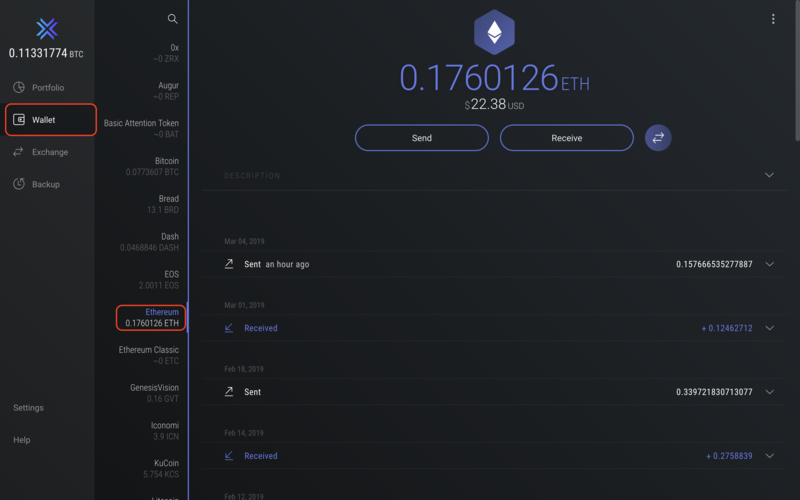 To send blockchain assets with Exodus, click Wallet on the left sidebar. Then choose the blockchain asset you would like to send. These instructions work for any blockchain asset, but in the examples below, Ethereum is used. 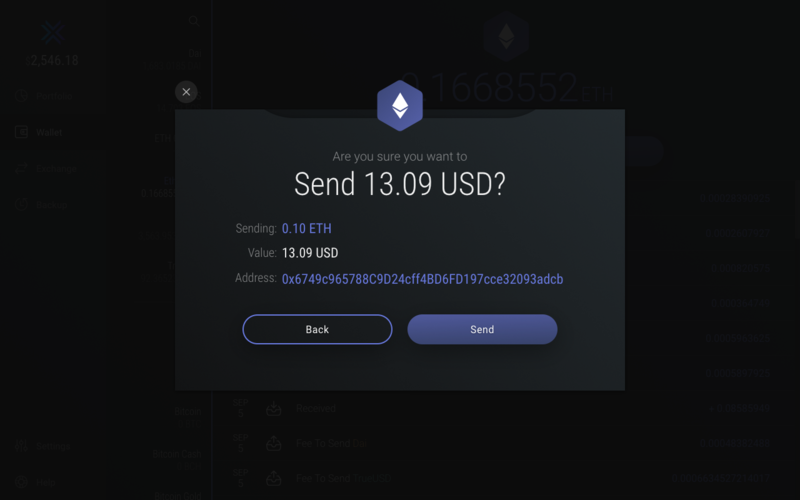 Click Wallet on the left sidebar, select the asset you want to send - Ethereum (ETH) in our example - then click the Send button. Just like traditional bank transfers, Exodus needs the address you want to send to. This address is similar to a bank account number. 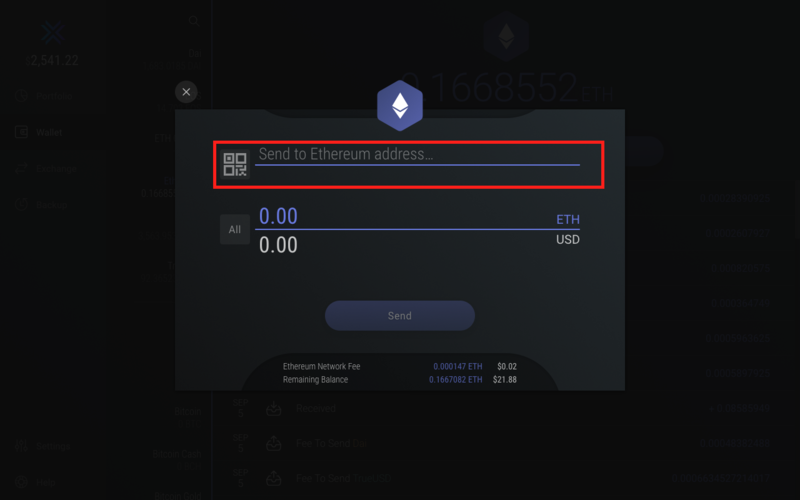 You can request an address from the person you want to send Ethereum to or enter your other Ethereum address from another wallet. Blockchain addresses are a long string of characters. Because it is easy to mistype a character, the best practice is to copy the Ethereum address to your clipboard and paste it into the to field. Alternatively, if you have a QR code you can click the QR code button located on the left side of the "to" field to scan the QR code. 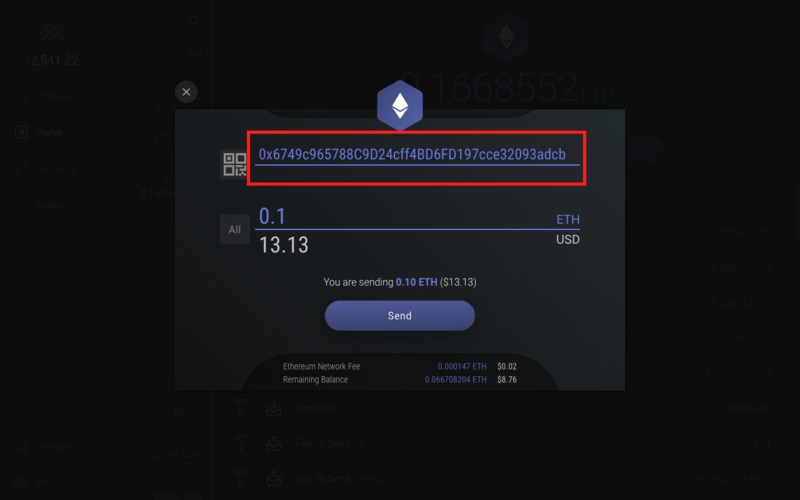 Exodus will then import the blockchain address from the QR code and insert it for you. Tripple check that the address is correct! Transactions on the blockchain are irreversible. Next, type the amount you want to send. 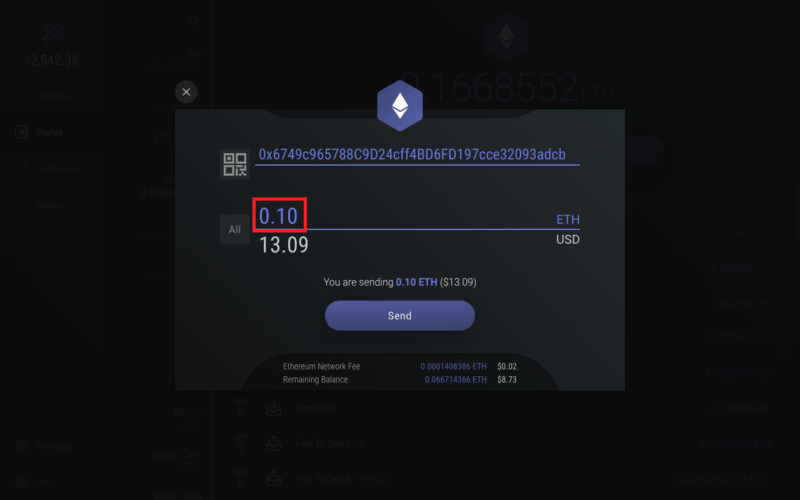 Exodus lets you send in the blockchain unit or you can enter an amount of fiat currency and Exodus does the conversion to Ethereum for you. Once you review the confirmation line telling you how much you are sending, click the Send button. Exodus will then confirm again you want to send the amount to the address. This is a good place to pause for a moment and double check your amount and address. If all looks good, click Send. Once sent, your transaction has been broadcasted to the network but may need to confirm before you see it in your receiving service. Often, exchanges will require a certain number of block confirmations before crediting a deposit.